In the closed-door meeting that he held at the beginning of Lent, on February 15, with the priests of the Rome diocese of which he is bishop, Francis sketched out in an unexpected way the trajectory of his life, describing it as a series of “passages,” some of them bright, others dark. Let’s review word by word this autobiography of his, very instructive on the personality of Jorge Mario Bergoglio, in the official transcription that has been released and that respects the disorder of his speech in Italian. In effect, the young Jesuit Bergoglio celebrated his first Mass in 1969, in 1970 became novice master, and in 1973, at the age of just 37, was appointed superior of the Argentine province of the Society of Jesus. He held this position until 1979, when his successor was a Jesuit close to him, Andrés Swinnen, and then until 1985 was rector of the Colegio Máximo di San Miguel. It must be noted, however, that already in this phase of success there emerged within him an inner disquietude, which he tried to resolve in 1978 by going “for six months, once a week” to a Jewish psychoanalyst, “who helped me greatly, when I was 42 years old,” as he himself revealed last summer in the book-length interview with the French sociologist Dominique Wolton. Desolation, dark time, dryness, spirit of defeat… In effect, beginning from 1986, when his bitter enemy Víctor Zorzín became the new provincial of the Argentine Jesuits, Bergoglio was rapidly pushed aside, sent against his will to study in Germany and finally forced into a sort of exile in the city of Córdoba, between 1990 and 1992, without any role anymore. He sustained himself with prayer. But even as he recounts it today, Bergoglio experienced those years with great suffering, in never-resolved tension between the sense of defeat and the will to make a comeback. And among those who held the power at the time in the Society of Jesus, both in Argentina and at its general curia in Rome, all the way up to superior general Peter Hans Kolvenbach, this lack of psychological balance of his and therefore his unreliability had become the shared judgment. But getting back to the account of his own life that Francis presented to the priests of Rome, here is the third and last series of “passages,” all of them once again on the rise, starting with that “telephone call from the nuncio” that – he says – “put me on another path,” that of the episcopate. It was the spring of 1992, and the Vatican nuncio in Argentina at the time, Ubaldo Calabresi, telephoned him to tell him that he would be consecrated bishop at the behest of the archbishop of Buenos Aires, Cardinal Antonio Quarracino, who wanted him as his auxiliary. The miraculous turning point that in 1992 plucked him out of the exile in which his confreres of the Society of Jesus had confined him was “prepared [for him] by the Lord – he was careful to emphasize – precisely in that “dark, not easy” period. But in any case that period did not resolve – to the contrary – his psychological qualms, as proven by two of the public “confessions” he has made as pope, one at the beginning of the pontificate and another a few weeks ago. 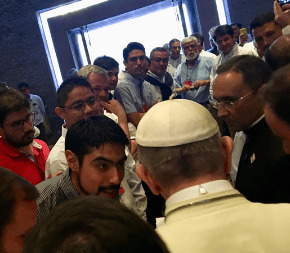 He told the second last January 16 to his fellow Jesuits from Chile (see photo), in the closed-door conversation that was afterward transcribed and published with his permission in “La Civiltà Cattolica” of February 17, and it concerns the reason why he does not want to read the writings of his opponents. “For my own good [mental health] I do not read the content of internet sites of this so-called ‘resistance.’ I know who they are, I know the groups, but I do not read them for my own mental health. If there is something very serious, they tell me about it so that I know. You know them… It is displeasing, but you have to go on. Historians tell us that it takes a century for a Council to put down its roots. We are halfway there. “Sometimes we ask: but that man, that woman, have they read the Council? And there are people who have not read the Council. And if they have read it, they have not understood it. Fifty years on! We studied philosophy before the Council, but we had the advantage of studying theology after it. We lived through the change of perspective, and the Council documents were already there. Our Lady of Mental Peace, pray for him and for us.